Which photo represents the true purest form of cycling? Sexpigeon has the answer. There are bike piranhas roaming the streets. 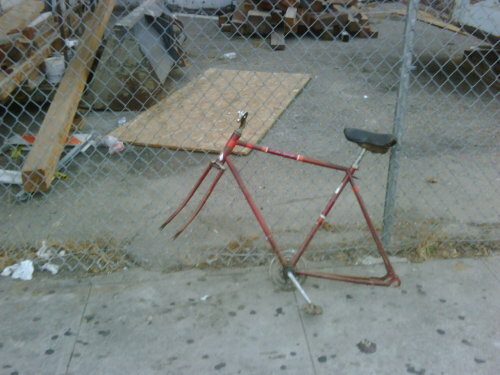 They can strip a fixie in 4 seconds or less, leaving its steaming carcass tied to a fence. I just feel, like, so much more connected to the road when the sparks are flying off as I scrape along the street, you know? I can’t wait till they get rid of the handlebars and front wheel altogether. I predict a unicycle trend within 2 years. Pff. You think I have time for a unicycle? Too much. I just walk around on pedals. fixies are the most incredible form of bicycle ever imagined off the track. i guess young people have energy and money for tires to burn…isn’t that stuff is expensive?